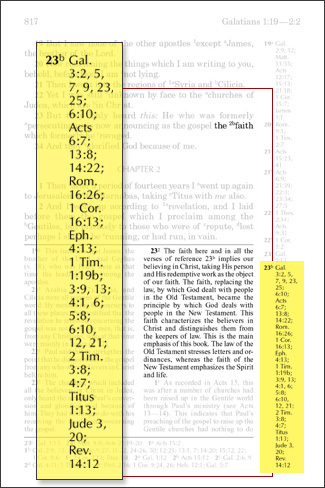 The Recovery Version contains over 26,000 cross references leading the reader not only to similar expressions and facts of history and geography, as do most cross references in other study Bibles, but also to other portions of the Scriptures that relate to the same spiritual truths and divine revelations. For example, cross reference b on the word faith in Galatians 1:23 links this verse with other New Testament verses that relate to faith in the objective sense, that is, to the faith as the contents of the complete gospel according to the New Testament revelation. Gal. 3:2 This only I wish to learn from you, Did you receive the Spirit out of the works of law or out of the hearing of faith? Gal. 3:5 He therefore who bountifully supplies to you the Spirit and does works of power among you, does He do it out of the works of law or out of the hearing of faith? Gal. 3:7 Know then that they who are of faith, these are sons of Abraham. Gal. 3:9 So then they who are of faith are blessed with believing Abraham. Gal. 3:23 But before faith came we were guarded under law, being shut up unto the faith which was to be revealed. Gal. 3:25 But since faith has come, we are no longer under a child-conductor. Gal. 6:10 So then, as we have the opportunity, let us do what is good toward all, but especially toward those of the household of the faith. Acts 6:7 And the word of God grew, and the number of the disciples in Jerusalem multiplied greatly; and a large number of the priests obeyed the faith. Acts 13:8 But Elymas the magician (for so his name is translated) opposed them, seeking to turn the proconsul away from the faith. Acts 14:22 Establishing the souls of the disciples, exhorting them to continue in the faith and saying that through many tribulations we must enter into the kingdom of God. Rom. 16:26 But has now been manifested, and through the prophetic writings, according to the command of the eternal God, has been made known to all the Gentiles for the obedience of faith. 1 Cor. 16:13 Watch, stand firm in the faith, be full-grown men, be strong. Eph. 4:13 Until we all arrive at the oneness of the faith and of the full knowledge of the Son of God, at a full-grown man, at the measure of the stature of the fullness of Christ. 1 Tim. 1:19 Holding faith and a good conscience, concerning which some, thrusting these away, have become shipwrecked regarding the faith. 1 Tim. 3:9 Holding the mystery of the faith in a pure conscience. 1 Tim. 3:13 For those who have ministered well obtain for themselves a good standing and much boldness in faith, which is in Christ Jesus. 1 Tim. 4:1 But the Spirit says expressly that in later times some will depart from the faith, giving heed to deceiving spirits and teachings of demons. 1 Tim. 4:6 If you lay these things before the brothers, you will be a good minister of Christ Jesus, being nourished with the words of the faith and of the good teaching which you have closely followed. 1 Tim. 5:8 But if anyone does not provide for his own, and especially for those of his household, he has denied the faith and is worse than an unbeliever. 1 Tim. 6:10 For the love of money is a root of all evils, because of which some, aspiring after money, have been led away from the faith and pierced themselves through with many pains. 1 Tim. 6:12 Fight the good fight of the faith; lay hold on the eternal life, to which you were called and have confessed the good confession before many witnesses. 1 Tim. 6:21 Because of which some, professing this, have misaimed regarding the faith. Grace be with you. 2 Tim. 3:8 And in the manner that Jannes and Jambres opposed Moses, so these also oppose the truth; men corrupted in mind, disapproved concerning the faith. 2 Tim. 4:7 I have fought the good fight; I have finished the course; I have kept the faith. Titus 1:13 This testimony is true; for which cause reprove them severely that they may be healthy in the faith. 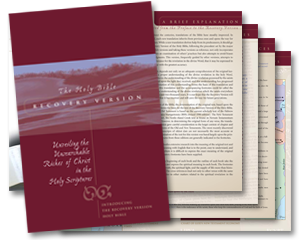 Jude 3 Beloved, while using all diligence to write to you concerning our common salvation, I found it necessary to write to you and exhort you to earnestly contend for the faith once for all delivered to the saints. Jude 20 But you, beloved, building up yourselves upon your most holy faith, praying in the Holy Spirit. Rev. 14:12 Here is the endurance of the saints, those who keep the commandments of God and the faith of Jesus.